In areas where there are not enough doctors and nurses to keep up with the demand for their services such as rural and underserved urban areas—state legislators are broadening the roles of some licensed health professionals through scope of practice laws. Supporters say expanding the authority of nurse practitioners, physician assistants, dental hygienists and other oral health providers to perform additional procedures and treatments will help alleviate health workforce shortages. Legislators have considered dozens of bills over the past several years. New Jersey lawmakers, for example, voted last year to allow greater flexibility in the way physician assistants provide care. They removed the requirement that a physician must always be present and allowed the physician assistant to work with a physician to define his or her personal scope of practice. 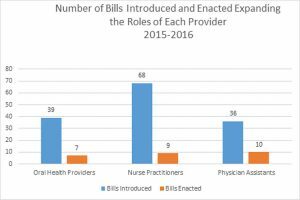 Maryland and Nebraska passed legislation in 2015 to allow nurse practitioners to practice without physician oversight. Proponents of these laws say licensed professionals can be trained more quickly and less expensively than physicians without compromising quality. Some physician groups disagree and argue that physicians longer, more intensive training equips them to diagnose more accurately and treat patients more safely. Scope of practice bills often bring out passionate advocates with different points of view. For those interested in more information on scope of practice policies for nurse practitioners, physician assistants, dental hygienists and dental therapists in all 50 states, D.C. and the territories, please visit the practitioner pages. Scores range from 1 to 25. The higher the score, the greater the priority. 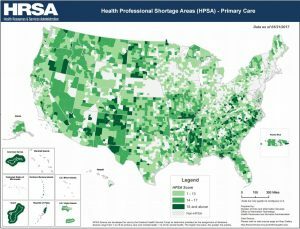 Sources: Health Resources and Services Administration and Rural Health Information Hub, 2016.